Active mountain fronts are subject to large scale slope collapses which have the capacity to run long distances on piedmont areas. Over time, fluvial activity and other gravitatory processes can intensively erode and mask primary features related to the collapses. Therefore, to reconstruct the history of their occurrence, further analyses are needed, like sedimentologic analyses. 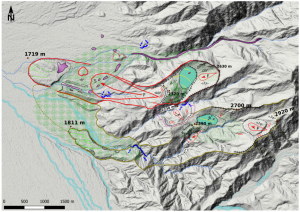 This work focuses on the occurrence of large rock avalanches in the Vinchina region, La Rioja (28°43’27.81” S / 68°00’25.42” W) on the western side of the Famatina range (Argentina). Here, photointerpretation of high-resolution satellite images (Google Earth) allowed us to identify two rock avalanches, with their main scarps at 2575 and 2750 masl. There are no determined absolute ages for these deposits, however by comparing their preservation degree with those dated further north (in similar climatic and landscape dynamics contexts), we can suggest these rock avalanches took place during the Pleistocene. We carried out a fieldwork survey in this remote area, including classical landslide mapping, structural analysis, deposits characterization and sampling. The deposits reach the valley bottom at around 1700 masl. with runouts about 5 km and 5.3 km long. In one of the cases, the morphology of the deposit is well preserved, allowing to accurately reconstruct its extension. However, in the second case, the deposits are strongly eroded by sources draining from the mountain front, therefore further analyses should be done to reconstruct its extension. In addition to morphologic interpretations, a multiscale grainsize analysis was done to di↵erentiate rock avalanches from other hillslope deposits: first 3D surface models of surface plots (5x5m) were built with SfM (structure from motion) photogrammetry; then classical sieving and finally laser grain-size analysis of deposits were performed. Samples were collected on different parts of the slope, but also along cross sections throughout the avalanche deposit. 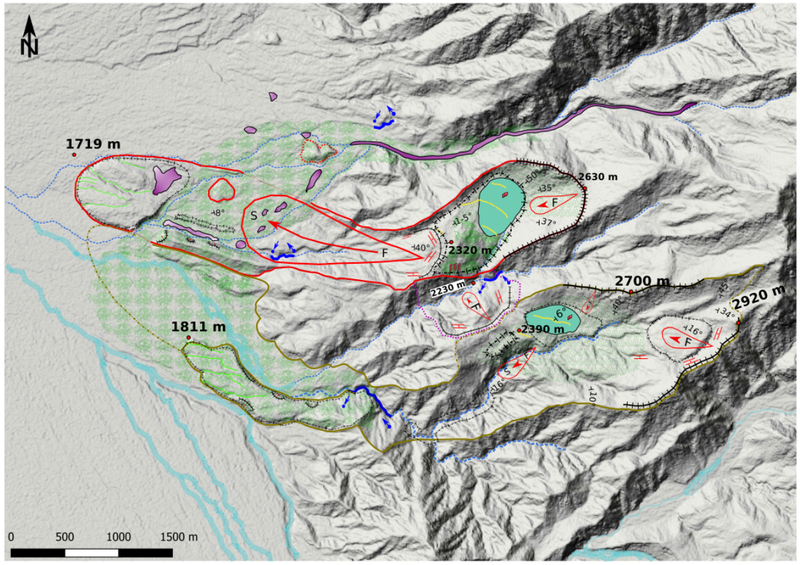 This deposits characterization was combined with results from mapping and image analysis to provide a first description of the sequence and the extension of events related to the evolution of this mountain front. The collected data helped to create a series of propagation models with the software DAN3D, developed by Hungr (2009). We chose a Voellmy rheology for the model with f = 0.10 ± 0.05 and ξ = 100 (m/s2) ± 50 (m/s2) for the rock avalanches and f = 0.10 ± 0.05 and ξ = 500 (m/s2) ± 200 (m/s2) for the debris flow. The results show a good propagation with more dispersion that we can see on the field. Part of the cover on the numerical model is not visible on the field, probably due to erosion and transport having moved the material, resulting in the current landscape. Director: Marc-Henri Derron, Michel Jaboyedoff. 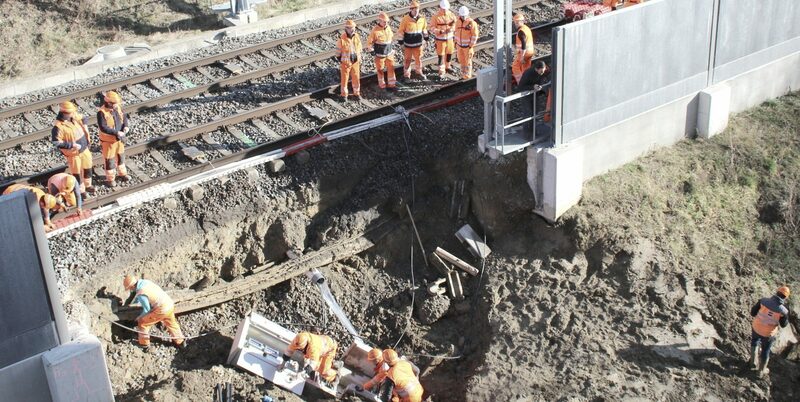 Geological and hydro-geological natural hazards, as landslides and floods, are a threat to many transport networks built in mountainous areas. These risks, that are often small in intensity, are poorly evaluated or unknown. This doctoral thesis focuses on the characterization and quantification of natural hazards that impact Swiss communication tracks. It also explores various remote sensing techniques dedicated to the survey of areas around traffic lanes. 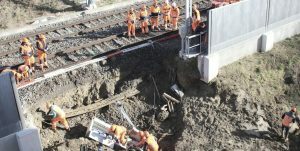 A database has been created to characterize the many small events that regularly affect roads and railway lines in order to compensate the lack of knowledge. The number of events and their trends – such as their spatio-temporal distribution, the weather, the geology, the direct damages or the types of affected tracks- are thus known at the national level over a period of five years (2012-2016). It shows that a natural event, on average, disrupts the traffic every 2.1 days and that the events occur mostly during the months of June and July, late afternoon. Direct costs were estimated at CHF 4 million per year, with an average cost per event estimated at 23 400 francs. In order to characterize the approaches to roads and railways, we have developed and tested the photogrammetric technique “on-motion Structure from Motion”, whose cost is reasonable. This remote sensing technic makes possible to obtain colorized and georeferenced 3D point clouds from images taken by four action cameras placed on a moving vehicle. Its accuracy has been evaluated in laboratory conditions and on many sites. It was also compared with seven other traditional surveillance techniques to identify advantages and disadvantages. This work highlights the impact and consequences of small-scale natural hazards that, taken as a whole, are not negligible for society. In addition, this study demonstrates that low-cost survey technic can compete with more expensive traditional survey techniques. Keywords: Natural hazards, transportation networks, on-motion Structure for Motion, topographical survey. François Noël, Teresa Gracchi and Emmanuel Wyser of the Risk Analysis Group (UNIL) went to Barcelonnette (France) from the 23rd to the 27th of September for an amazing experimental work in the field dealing with rock fall trajectories and associated topics (e.g. impact response, energy transfer, etc. ), amongst other French researchers from Active Deformation Group of the University of Strasbourg (EOST, leaded by Jean-Philippe Malet) and the IRSTEA Institute of Grenoble (leaded by Franck Bourrier). Several (30) rocks were thrown down into a short but steep gully while seismic signals (EOST) and high-speed imaging (IRSTEA & UNIL) were acquired. High resolution 3D imagings were acquired thanks to TLS and SfM. Accelerometers (ISTE & EOST) were also included in few rocky blocks to monitor and acquire data to better understand impact response, angular velocity changes and other exciting data.